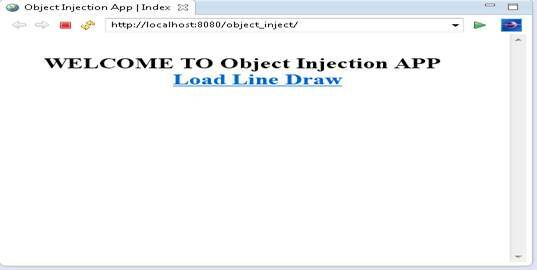 In this article, we will learn about the Object injection and the process to inject an object using spring mechanism. A class is a user defined data type, while we define an instance of that type, this instance is called object. Hence an object is a class instance that is used to access class member variables and methods. While we create an instance of a class into another defining class is called object injection. To access data members of a defined class, it is necessary to create an instance of this class. This instance may be created using new keyword in java. But this kind of creating an instance of a class is considered as a tight coupling of a creating instance of a class. Spring provides a way of creating an instance of a class in the way of Loose Coupling. Once a class instance has been created, this may be used within other classes. This type of object access is known as Object linking or injecting. Let’s discuss with an example that will create a web application using Spring MVC and inject one bean into another bean into the spring configuration file. All the request hits to web.xml deployment descriptor file that transfers these requests to ServletDispatcher class defined into the “org.springframework.web.servlet” package. The above code loads index.jsp as default view and transfers all html file request to DispatcherServlet class. All the requests are transferred to “ObjectInject-servlet.xml” spring configuration file that loads all the controllers defined into package “com.springmvcapp.controller” using <context:component-scan> tag. A <bean> tag is defined to define all the views that should be loaded on specific response processed by controller against a specific request. The above coding defines MVC pattern for the application. It define the directory path for controller, models and view and also defines, how to manipulate controller, model and view classes. Now, Lets define a controller class “ObjectInject”. Annotation @Controller is used to define “ObjectIntect” class as a controller class, where @RequestMapping annotation is used to define map url with the controller methods. The line() method defines a ApplicationContext object that creates and instance of Line class using “line” bean definition and call method draw() of Line class. Now, Define a Line class this class creates two instance of Point class. The above code creates a bean class “Line” that creates two instances of class Point and its getter() and setter() methods. These methods are used to access line points to draw a line. To access these points, getX() and getY() method of Point class are called. The above code defines a bean class “Point”. It declares two private member variables x and y and its getter() and setter() methods. A spring configuration file “spring.xml” is defines into the classpath to define bean object of “Line” and “Point” classes. When an application is deployed, it loads index.jsp page. The above code displays the welcome message and creates an anchor tag that request for line.html page to be loaded. 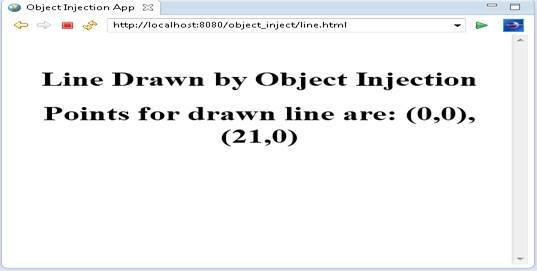 When line.html page is requested to server, it requests to controller “ObjectInject” to execute method “line()”. This method loads the welcome.jsp file defined in “WEB-INF/jsp” directory. The above code loads the welcome message as “Line Drawn by Object Injection” and also displays the message using “message1” that is processed by line() method of controller class “ObjectInject”. The above figure displays the index.jsp page by default as shown in the figure. Figure 2: loads welcome.jsp page on request of line.html page. The above url request loads welcome.jsp page, once user requests for line.html page. This request hits line() method of “ObjectInject” controller that redirects the response to welcome.jsp page and displays the message processed from line method with the string processed by welcome.jsp page. 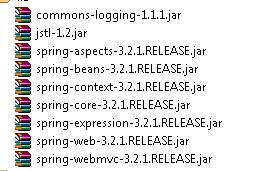 The above figure shows the list of jar files required by Spring framework to run web application based on Spring Framework. 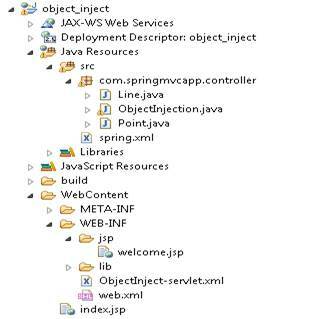 The above figure shows the directory structure created by Eclipse IDE that creates a web application managed by Spring MVC framework. How do we inject an object using spring mechanism?